This Palmetto style 1389 expanded PTFE and graphite compression packing seal protects pumps, valves and other equipment from fluid leaks in general service and light slurry applications. The interwoven braided packing seal is made of expanded polytetrafluoroethylene (ePTFE) (100% GFO) yarn. 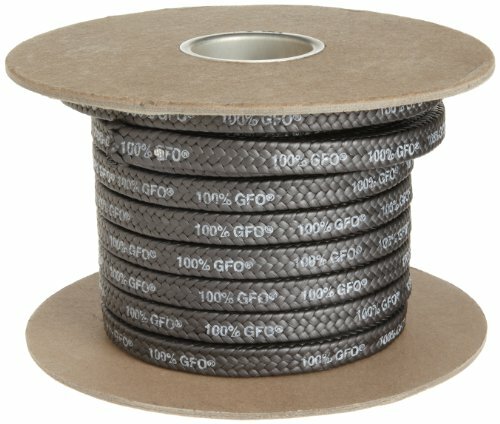 ePTFE is a strong, flexible material that exhibits the same characteristics as polytetrafluoroethylene (PTFE), such as low friction and resistance to harsh chemicals, but has a more porous, conformable structure that accepts lubricant better and helps reduce leak-off in applications with irregular surfaces and gaps. The PTFE yarn is heavily loaded with ultra-pure graphite powder that transfers heat away from the shaft to prevent glazing and scoring, extending the packing and sleeve life. Graphite also reduces thermal expansion and enables the packing to handle high shaft speeds. The packing seal is saturated with Palmetto’s proprietary inert lubrication system (Matrix) that improves break-in time, reduces frictional heat, and prevents the packing from spinning with the shaft or stem, further reducing the chance of scoring and wear. This packing seal is compatible with media in the pH range of 0-14, except strong oxidizers in the 0-2 pH range, such as oleum, fluorine, and fuming nitric acid. It has a maximum pressure limit of 1,900 pounds per square inch (psi), a pressure-velocity (PV) factor of 650,000, and a shaft speed rating of 4,300 feet per minute (fpm). It operates across a wide temperature range from -400 to 550 degrees F (-240 to 288 degrees C). Style 1389 is suitable for use in applications with high speeds and moderate to high pressures, and is used in equipment such as rotating pumps, mixers, extruders, reciprocating pumps, and agitators, among others.